I adored this book! I read the ending three times, and really didn't want to send it back to Jen from Banned Book tours. This was such a fabulous book! I love a story with a epic romance, good versus evil, and a storyline that is almost fairy-tale like. It is so refreshing to read one that isn't full of immensely flawed characters (where I wonder if I can even route for them), bad boy romances where the bad boy is literally hurting the main character (but he is just troubled, so she loves him more? ), and books that are so complex I wonder if I will ever figure them out. 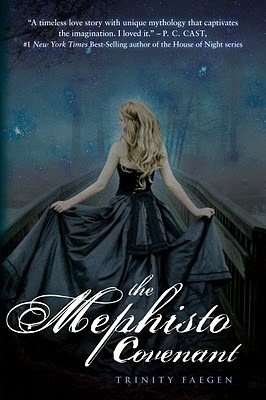 The Mephisto Covenant is a tale of good versus evil, dark versus light, with a wonderful love story added in. I loved the relationship between Sasha and Jax. I loved that he was so kind and gentle with her- even though he was supposed to be this "bad boy." Thank you! Thank you for making a male character believable! I thought it was incredibly romantic that he was after her heart and NOT her body. I loved the characters in this book- and I loved the "bad" characters. I found myself tearing through this book, wondering what would happen next. The ending blew me away! If you haven't read this book yet- go read it. Don't compare it to other books (I'm looking at you Hush Hush and Fallen), because although they are similar the fact that they deal with heaven and hell- that is where the comparing of the two should end. Sasha and Jax have a truly special relationship- and one that I hope many readers will get to enjoy! Wow, this is an impressive book. I'm on the lookout. I'm so glad you liked it! I gave it one star, for some reason i just couldn't get into it, and I didn't like any of the characters haha, I'm glad a lot of people have been enjoying it though! Great review! Very intricuing review. I'll have to give it a gander.